At each of the Twilight Summer Concerts there are several Downey booths to promote various Downey associations. 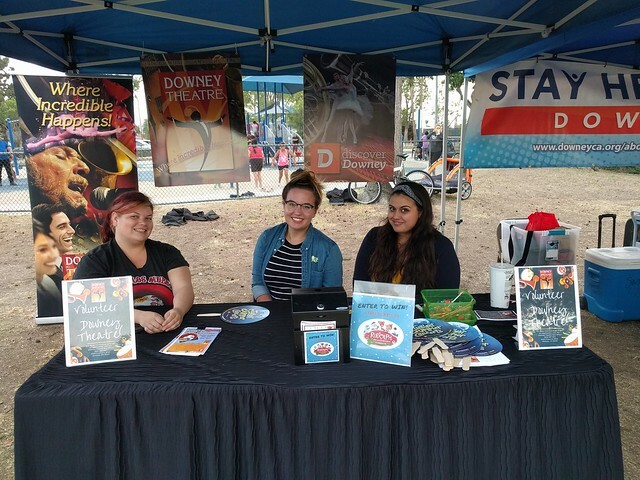 This is Nellie, Emily, and Ashley, who are helping visitors learn about volunteering for different activities in Downey. There is the 6th annual Downey Dia de los Muertos Art Festival coming up in October. Volunteers are also needed to help at the different shows and concerts at the Downey Theater. You can contact them at Boxoffice2@downeytheatre.org. When you stop by their booth next week, register for a chance to win two tickets to the upcoming "Rudolph the Red Nose Reindeer." I won last year and took my grandson. We both loved the show.